The Acquisition of marine magnetic data on seismic exploration vessels has increased dramatically over the last five years. More sensitive magnetometer equipment, combined with new software processing methods are proving that marine magnetic data can enhance 3-D seismic geological interpretations. The author journeys aboard a seismic research vessel with a crew from FUGRO- LCT, and describes how Sea SPY Overhauser magnometers are used to enhance exploration geological/geophysical data models. The continuing search for new oilfields relies primarily on using seismic methods to analyze the geology of a region. 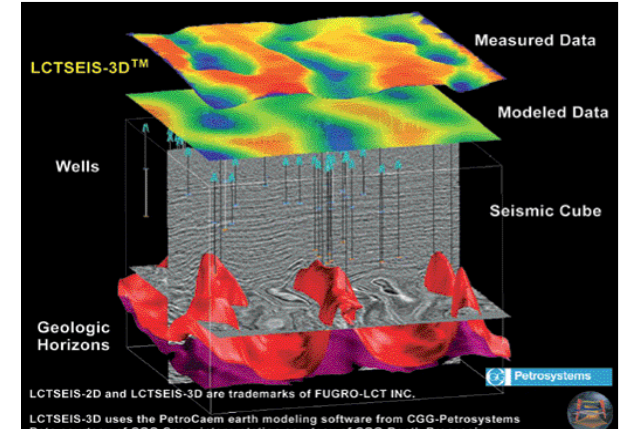 In recent years, 3-D seismic visualization models have improved the oil and gas exploration process tremendously. This advancement has only strengthened the demand for further improvement. A marine seismic survey is an impressive operation by any standards, both in terms of organization and cost. One survey can involve a fleet of vessels, equipped with millions of dollars worth of equipment and instrumentation. The concept of significantly increasing the quality of results for the relatively small cost of magnetic survey equipment can be attractive. But convincing seismic surveyors to change their ways to accommodate a new sensing method can be difficult, if not impossible. The only way that marine magnetic data can be acquired in conjunction with a seismic survey is if the magnetometer equipment does not interfere in any way with the seismic equipment. The environment is set by the seismic procedures. The magnetics personnel and instrumentation must adapt. To survey a geological area, the area must be broken down into a pattern of parallel lines, along which the vessel must navigate. 3- D seismic surveys usually cover smaller areas than 2-D surveys, but it is still not unusual to see survey lines 100km or more in length. With the vessel averaging about 5 knots, one line can take more than 11 hours, during which the magnetometer must run continuously. A few hours can usually be used for diagnostics and repair while changing lines, but the equipment is expected to operate continuously for weeks at a time. Meanwhile, the vessel is isolated at sea, and it is very difficult to bring in spare parts. An equipment failure here would be a huge and costly problem, so reliability is the number one priority. When acquiring magnetic data over a long time period, absolute accuracy becomes very important. Overhauser magnetometers like SeaSPY do not drift due to effects such as temperature, time, or even magnetic heading. However, the Earth’s magnetic field is continually fluctuating, mostly because of influence from the sun. This effect, known as diurnal variation, can slowly affect the absolute value of the Earth’s field by hundreds of nT (nanoTesla) over the course of a day. This is 4 to 5 orders of magnitude greater than the sensitivity of the magnetometer. Since diurnal variations affect large areas of the Earth uniformly, it is possible to remove them by using a stationary reference magnetometer, known as a base station. Ideally, the base station should be positioned in the center of the survey area, but in practice, it is usually installed on shore as close to the survey area as possible. The main sensing element in a seismic survey is the streamer cable, a liquid-filled flexible tube that contains an array of hydrophones. A single 3-D survey vessel will typically trawl between 4 and 12 streamer cables, each about 2.5km in length. The array of streamers is deployed so that the hydrophones are arranged in a tightly controlled grid pattern in the horizontal plane. Each of the streamer cables costs millions of dollars, so obviously physical contact with anything is not acceptable. When deploying a towed magnetometer, the first priority is to make sure it stays away from the streamers. FUGRO-LCT does this by using buoyant tow cable developed and supplied by Marine Magnetics. The cable contains a floatation foam that keeps it at the surface, and weight inside the towfish then brings it to a shallow depth away from the swell. Keeping the tow cable out of the way at the surface allows very long cable lengths to be deployed without risk of contacting the streamers, which are typically 10m below the surface. Ideally, the magnetometer cable should be towed at a distance of three times the length of the vessel, to be clear of the vessel’s magnetic interference. 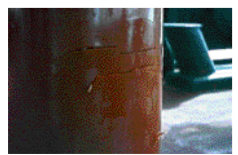 Closeup of impact damage sustained during a week-long continuous deployment in the Gulf of Mexico. The signs of impact were only discovered when the towfish was retrieved, since the magnetometer was not affected operationally. Further obstacles are the large powerful airguns, trawled by floating umbilicals, that generate the sound pulses the hydrophones listen for. The guns are normally deployed about 35m behind the vessel, while the magnetometer is kept at a distance of 250m. Some surveys have the guns deployed from a completely separate vessel, which makes magnetometer deployment slightly easier. The seismic streamers are deployed first, starting with the tailbuoy, by large paravanes that keep the streamer away from the ship during deployment. Once the streamers are in place, the magnetometer can be deployed. Since an even number of streamers is used during a 3-D seismic survey, there is usually a clear path straight aft of the vessel, and this is where the magnetometer is placed while trawling. A winch is always used to speed deployment and retrieval. From the winch, a deck leader extends the tow connection to a control room where the data logging equipment is stored, along with gravity meters that are almost always used in conjuction with a magnetometer survey on a seismic vessel. The airguns are deployed only when the magnetometer is in place. This is where the buoyancy of the magnetometer tow cable does its job. With the cable visible at the surface, the guns can be deployed around it, and kept clear of it. Having the magnetometer tow cable at the surface leaves it free to contact other objects, such as debris. To protect against this, the tow cable has a thick polyurethane jacket, and the towfish is covered with polyurethane ‘armour’ for high abrasion resistance and impact toughness. At times, the towfish has suffered severe impact from unknown objects, and the survey has continued without interruption. Keeping the tow cable at the surface keeps it straight along its deployment length, not curved as it would be if it were allowed to sink gradually to a deep towfish depth. As the vessel moves up and down on the swell, there is little elasticity in the towing system to dampen movement in the towfish. A severe sea state can not only add periodic position error to magnetic data, but can also severely wear the tow cable and connection assembly as slack is constantly created, and taken up suddenly. Increasing the towfish drag in the water dampens peaks in the towing force by increasing the average towing force. Adding drag to the towfish also increases its natural towing depth, which is otherwise affected by towing speed and the buoyancy of the cable. This is easily adjusted by increasing the weight of the towfish, or by fastening extra lead weight to the tow cable itself. With increased tow force damping, position error becomes highly correlated to the position of the ship, and is easily eliminated by a good positioning system. With a long cable length deployed, high towfish drag, and a rough sea state, steady stress on the towing system can be considerable. To prevent failure under even the most extreme conditions, the tow cable uses a very high performance vectran strength member that is stiffer than kevlar, giving it a high working load, and allowing it to keep a relatively small diameter and weight. A S e a S P Y m a g n etometer transmits data digitally over the tow cable, and its communication system does not use high frequencies, so an elastic twisted pair configuration is used instead of more fragile coax. Marine magnetometer data contains important geological information such as the thickness of sediments, the locations of faults, and the aerial extent of volcanic rocks. In frontier exploration areas marine magnetics and gravity data are often combined to provide a low cost regional exploration tool for the delineation of large basins prior to conducting expensive seismic surveys. In more mature exploration environments marine magnetics data are often combined with gravity, seismic and well log data to generate an integrated geophysical interpretation of the prospect. The first step in conducting an integrated geophysical interpretation is the construction of a hypothetical 3D geologic earth model of the prospect using the magnetic, gravity, seismic and well data as an initial qualitative guide for the shapes and sizes of the geologic structures. The earth model consists of a bathymetry layer, geologic horizons, and faults with each layer of the model having a unique set of physical rock properties including density, velocity and susceptibility. After computing the magnetic, gravitational and seismic response of the model, the explorationist analyzes the similarities and differences between the computer generated responses and data that was measured in the field. In areas where the computed model and measured data are in good agreement the explorationist can have a high degree of confidence in the validity of the earth model. In areas where the computed model and measured data are not in good agreement the explorationist is free to change the earth model until the computed response matches that of the measured data. As magnetics data provides an independent measurement of a specific rock property (susceptibility or ferrous mineral content) its integration with other data such as gravity, seismic and well log data that measure different rock properties yields a more highly constrained earth model. A well integrated and constrained earth model enables the explorationist to reduce exploration risks. Advances in marine magnetometer equipment and increases in the utilization of the magnetics method at sea have played an important role in both the reduction of exploration costs, and the reliability of geologic interpretations. Doug Hrvoic has been working in the geophysics industry as an engineer since 1992. He is president and co-founder of Marine Magnetics Corporation, a company specializing in engineering magnetic sensing equipment for marine applications. Posted on Monday, April 27th, 2015. The following form will provide you with the information and instructions for the return of merchandise purchased from us for examination, credit, or exchange.